What if you could predict when your equipment was starting to break down and fix it before it actually fails? It’s possible with the powerful combination of predictive maintenance (PdM) data and computerized maintenance management system (CMMS) software. 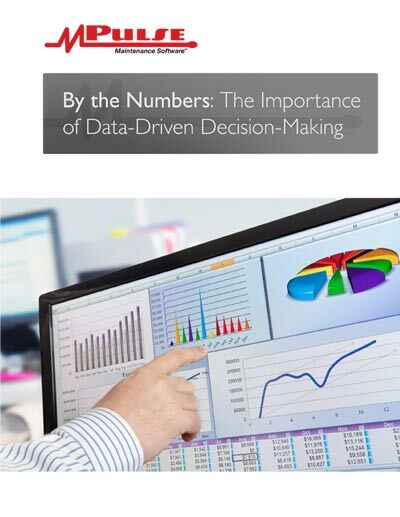 While PdM tools provide powerful data, that information’s value is limited without the context provided by CMMS software. The combination of PdM data and a CMMS solution provides the most comprehensive view of your equipment. Learn 5 important questions CMMS can help you answer to boost the effectiveness of your PM program. If you’re measuring asset health with gauges, meters, or other methods, you’ve got important data that should be stored in a CMMS. Likewise, if you’re using other measurement techniques like infrared thermography, vibration analysis, or lubrication analysis. CMMS software captures this data and incorporates it into a comprehensive view of asset health. It provides readings in the context of other measurements, and it shows a history of readings over time. With this “full picture” you not only understand your equipment’s current condition, you can begin to predict future problems. 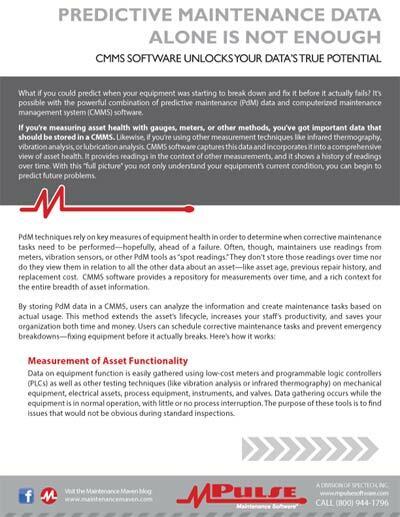 PdM techniques rely on key measures of equipment health in order to determine when corrective maintenance tasks need to be performed—hopefully, ahead of a failure. Often, though, maintainers use readings from meters, vibration sensors, or other PdM tools as “spot readings.” They don’t store those readings over time nor do they view them in relation to all the other data about an asset—like asset age, previous repair history, and replacement cost. CMMS software provides a repository for measurements over time, and a rich context for the entire breadth of asset information. 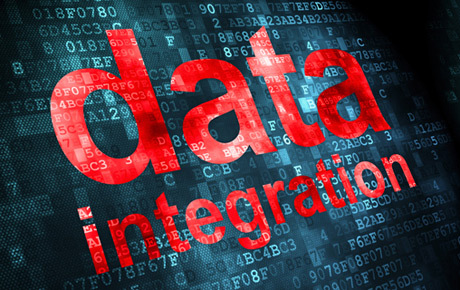 By storing PdM data in a CMMS, users can analyze the information and create maintenance tasks based on actual usage. This method extends the asset’s lifecycle, increases your staff’s productivity, and saves your organization both time and money. Users can schedule corrective maintenance tasks and prevent emergency breakdowns—fixing equipment before it actually breaks. Data on equipment function is easily gathered using low-cost meters and programmable logic controllers (PLCs) as well as other testing techniques (like vibration analysis or infrared thermography) on mechanical equipment, electrical assets, process equipment, instruments, and valves. Data gathering occurs while the equipment is in normal operation, with little or no process interruption. The purpose of these tools is to find issues that would not be obvious during standard inspections. When this real-time data is added to the CMMS software, either remotely or manually, its true potential is realized. With CMMS software, you can see data trends and indicators of inefficient operation or impending failure. You’ll get alarms and alerts for current conditions that indicate future problems, enabling you to take action before the equipment breaks. Additionally, the real-time data is logged in the CMMS system with the rest of the maintenance data, putting it in context, and giving you much more powerful information about your assets. This information increases in value over time because prior failure patterns can predict future failure patterns. 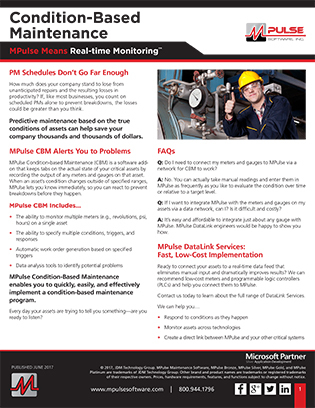 With this information in hand, you can make proactive decisions about when maintenance tasks need to be performed. The combination of PdM data and CMMS software takes you beyond standard preventive maintenance tasks. Instead you can determine what asset needs maintenance, whether it’s scheduled or not. You can also plan PdM tasks during equipment off-hours, increasing productivity for your organization’s operations. The result is fewer emergency repairs, longer equipment life, and improved safety. While PdM tools provide powerful data, that information’s value is limited without the context provided by CMMS software. The combination of PdM data and a CMMS solution provides the most comprehensive view of your equipment. Using this information, you can schedule maintenance work based on the true condition of your assets, helping your company make informed business decisions and saving both money and time. What can CMMS + PdM do for your organization?